Despite the problems of the mining industry, a decline that seriously affected the entire Jiul Valley, the credit union recorded a constant upward trend in the activity. All the office spaces were updated/modernized, and we keep permanently up to date the IT and office equipments. The periodic maintenance operations were completed with replacement of damaged elements. The outdated or less functional equipments were updated, providing efficiency, security, protection of the values and documents. To keep this trend, in the last couple of years the policy of expanding in rural areas was implemented by CAR Straja IFN too. 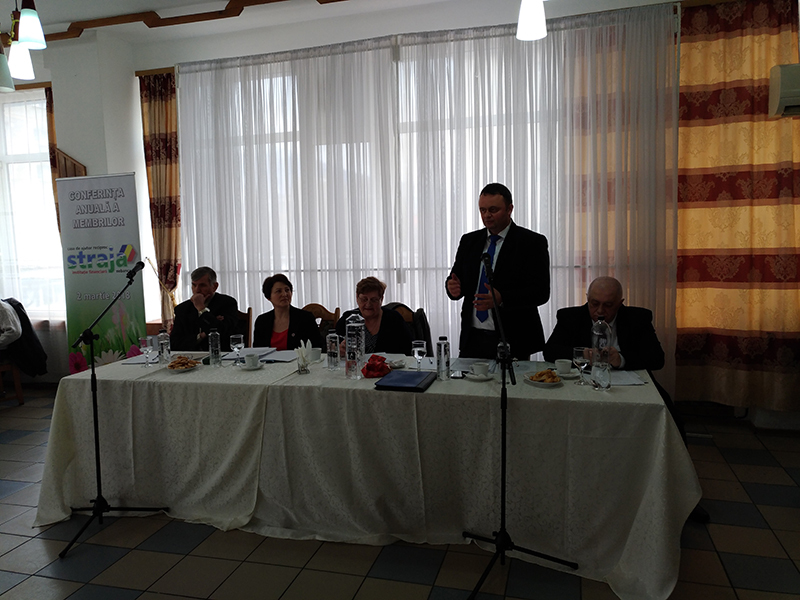 At first two agencies appeared in Turburea-Gorj County and Sebis- Arad County. Both agencies activate in rented offices, properly modernized and equipped by the credit union in order to provide the same professional level of services as the two offices in Lupeni and Uricani.The Turburea and Sebis branches reached financial status that allowed them to become agencies, with permanent employees. These agencies were also equipped to offer PayPoint services to the members. With the experience earned, the two agecies were quickly followed by other ones in Turceni and Scoarta - Gorj County, and Arad, Ineu, Santana and Pancota - Arad County, and the process continues. All the new agencies are offering the same high standard of services to the new members, respecting the brand we already created. The financial services were permanently updated in accordance to the members needs and requests. Special events, like Christmas and Easter, occasioned promotional financial services, focused especially on the members with modest income. We are now also offering now low interest loans for holidays and treatments. This way we encouraged the members to continue saving, maintain their status as members and to recommend our services to others too. The members of the Board tried continuously to keep the range of services updated in accordance to the members needs. Keeping under surveillance the financial crisis and the everchanging social environment of the Jiul Valley, the loan types are adapted in order to cover the problems our members have. We are in permanent touch with the members, all their requrements are carefully analysed. 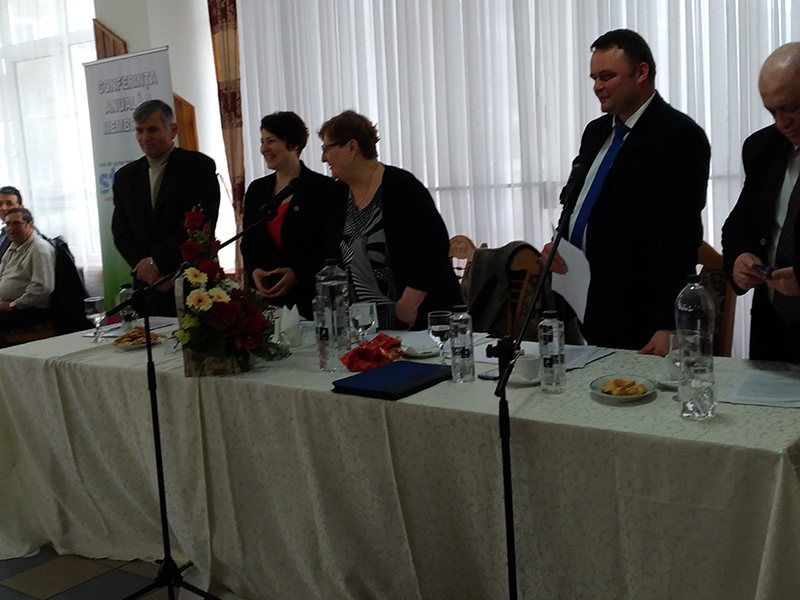 The financial records of the members are under scrutiny not only inside the institution but, thanks to the central database(CiCAR) created by UTCAR Hunedoara, also countywide, allowing us to avoid granting bad loans. The range of services is structured in two main cathegories of loans, traditional and optional. The traditional loans include the following services: traditional in the limit of the shares account, granted immediately; traditional for capitalization, dedicated for increasing the shares account; standard and outstanding traditional loan - 3-5 times the shares account, granted to the members with a clean reimbursement history. Additionally to these types a member can also access a supplemental traditional loan that can be reimbursed in maximum 60 months. The range of optional loans include: the emergency loans (granted for 1-4 weeks, meant to cover urgent needs until the next payday), the short term loans (granted for 1-12 months) and medium term loans. In all these cases the amount of these laons is conditioned only by the member's loan record and his financial status. Based on a carelful analysis of the members need, CAR Straja IFN intends to prolong the reimbursement periods for both traditional and optional loans. The loans are granted usually the next business day after they were requested, except the ones that are within the limits of the shares accoiunt, that are payed immediately. The paperwork is entirely computerized, offering a swift and efficient access to the services. The loans can be granted in cash or transferred into the beneficiaries bank accounts. The reimbursements can be made in cash, bank transfer to one of the credit unions bank accounts, or using the POS devices installed in two of our offices, in Lupeni and Uricani. A credit union is, besides a financial institution, primarily a non-profit association focused on the mutual help of its members. That's why, next to the range of loans, CAR Straja IFN also offers several diferent aids. One of them is the non refundable burial aid, offered in case a member deceases. The amount is conditioned by the seniority as member and varies between 400 and 1800 lei. Starting January 2011, this aid is also granted in case a of a family members decease, in amount of 200-900 lei. 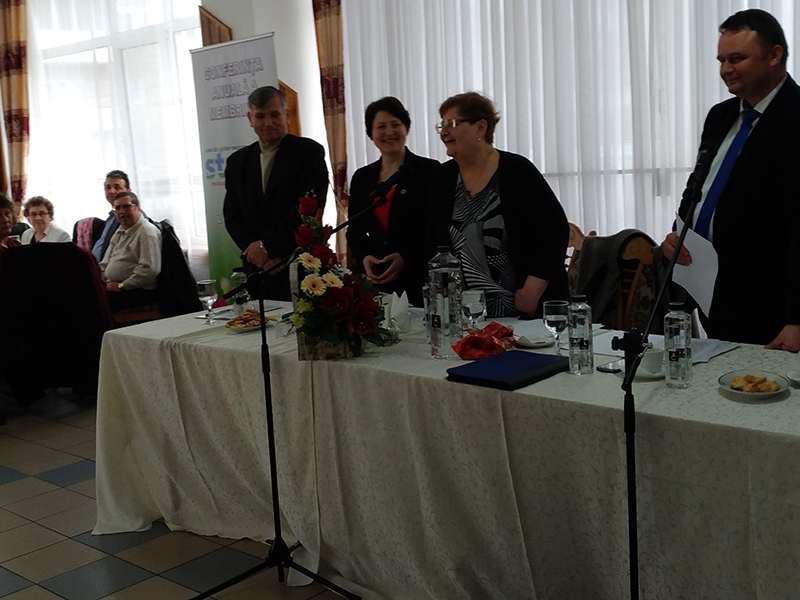 CAR Straja IFN also participates in the "Development through knowledge" program of the territorial association (UTCAR) that offers university scholarships to the gifted children of members with low incomes. Until 1983 the credit union grew to more than 3000 members and remained attached to the workers union from the Lupeni Mine. Then the national unions association, UGSR, decided to merge all the Lupeni credit unions under a common entity. This way C.A.R. E.M.LUPENI, C.A.R. Învăţământ LUPENI, C.A.R. Sanitar LUPENI, C.A.R. Vâscoza LUPENI, C.A.R. Ţesătoria de mătase LUPENI and C.A.R. 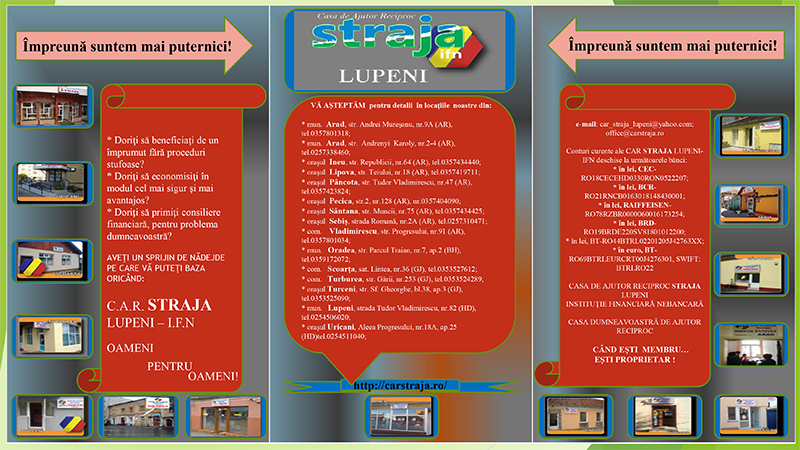 Grup Şcolar Industrial LUPENI, united as C.A.R. Oraş LUPENI, totalizing almost 4.500 members. 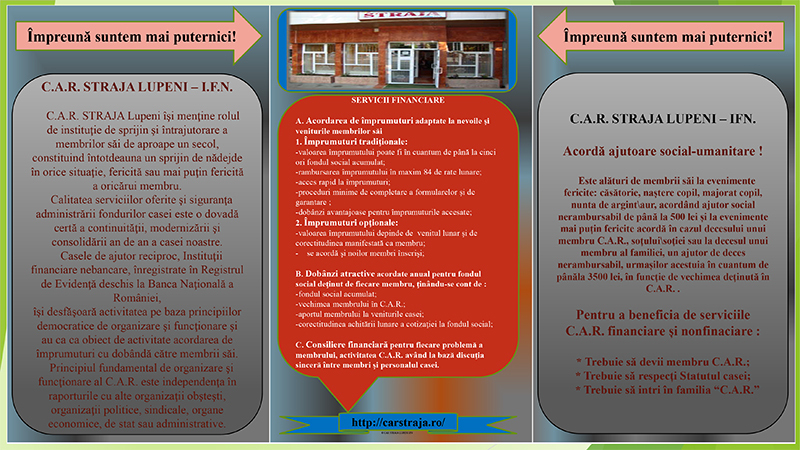 In 1991, under the cover of the new laws that granted independence to credit unions, 100 founding members decided to recreate CAR E.M. Lupeni and immediately affiliated to UTCAR Hunedoara. The success of this decision became obvious with the fast development, It activated in the Lupeni Mine's office building, in a less than optimal location until 2002, when the managing Board decided to purchase and properly equip an office space in the city center, This new office became almost a home for the members, a place where their requests are answered, where they are treated with respect and solicitude, just like family members. The modern technology is all around, the modern IT ifrastructure, office equipments, security and surveillance features are all meant to provide an efficient and secure environment for financial services. The E.M. Lupeni credit union offered permanent support to the members, in any circumstances, both fortunate or unfortunate, standing out as an example for smaller credit unions in the area. This status led to a series of mergers throughout the years. In december 2000 CAR E.M. Uricani merged with CAR E.M. Lupeni. In order to properly service the members from Uricani, the new Uricani agency was relocated from the mine's office building to an office in the city center, that was modernized and permanently updated since. The relocation was a success, the agency members number grew from 283 to 606 in several years, despite the Uricani Mine's decline. In May 2003 CAR E.M.Lupeni absorbed CAR Sanitar Lupeni (263 members), maintaining an operating point for providing information and paperwork. 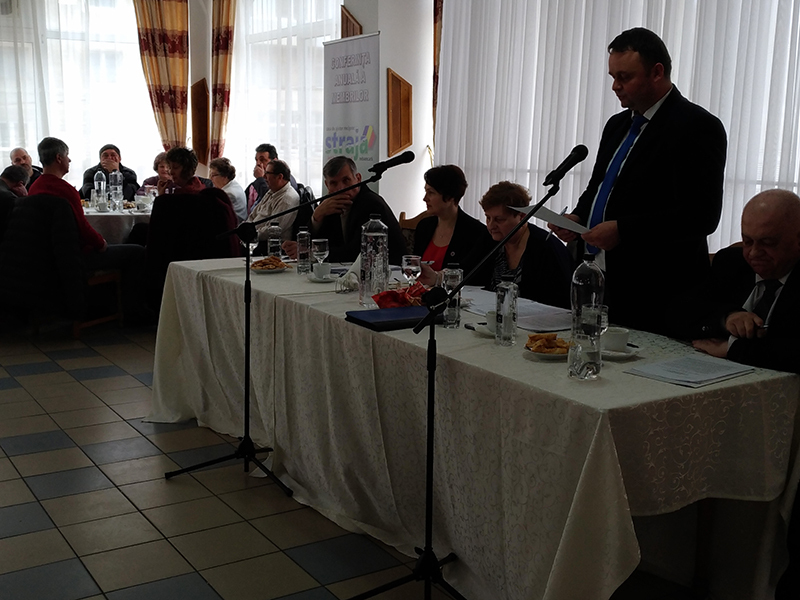 In March 2005 the members decided to change the name of the credit union, into CAR Straja Lupeni, to better mark the new status of a more than citywide financial institution. The next year, as a conseqence of the closure of the Barbateni Mine, CAR Straja absorbed the 188 members of CAR E.M. Barbateni too. Agenții/Agencies: Uricani,Turburea, Sebiş, Turceni, Arad, Sanitas Arad, Scoarţa, Ineu, Sântana, Pâncota, Lipova, Vladimirescu, Pecica, Oradea, Șicula, Șiria.